2 Bedroom 2 Bath on Tenmile Creek, Frisco! 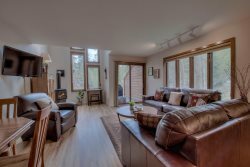 We take personal pleasure when we successfully match a family or a group of skiers with Colorado vacation lodging that someone's vacation home which would otherwise be sitting idle. Everyone benefits! Why stay in a hotel when you can get a beautiful townhouse or condo for less? Vacation like a local! The properties you find on our site are all owned by people who share a love for Summit County and the recreational benefits and pure beauty found only there. The owners furnish and maintain their properties and when you book your vacation, you will be a guest in their home. This is clearly a step away from anything you'll find offered from the big management companies who place guests according to "available inventory" without thoughtful consideration of your needs and the uniqueness of each property. We get to know each of our Colorado rental cabins, and keep the total number we represent manageable so that we truly know each one. This philosophy helps us be best able to fit you in the perfect property for your needs. That's our promise to you. Thank you for inquiring about he services of 5 Diamond Lodging! We love to take the time to find the perfect match for each of our customers, so send us your question / comment, and you'll hear from one of our representative within 24 hours.